This is a vegan gelato and I was going to label this entry as Vegan PB&J Gelato, but somehow this misses the point and emphasizes the wrong thing. 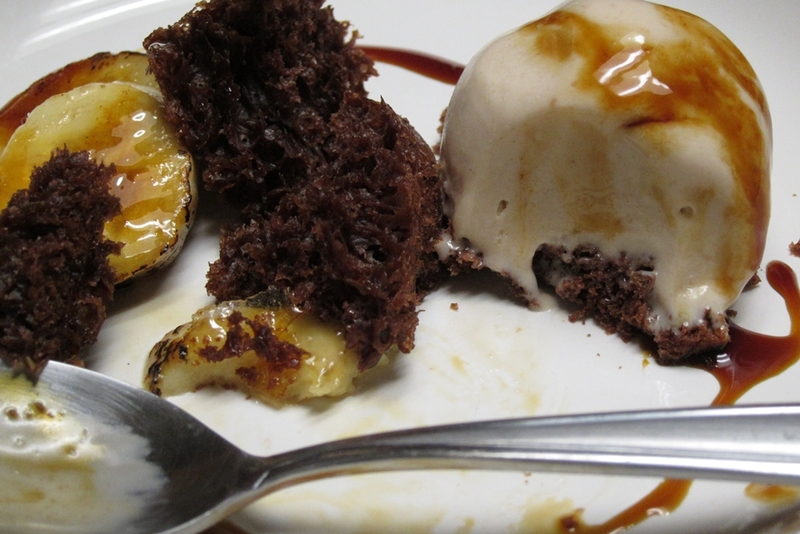 This is a delicious intensely flavored gelato that happens to contain no eggs or dairy! The good people from the Modernist Cuisine books set out to make an awesome frozen dessert not necessarily one that is specifically tailored to be vegan. I’m sure if adding pork fat made it better, they would’ve added that in there too. This recipe is from Modernist Cuisine at Home (MC@H), but the basis for it is the Modernist Cuisine recipe for Pistachio Gelato. Like the macaroni and cheese, the pressure cooked caramelized carrot soup and the pastrami, the vegan pistachio gelato is another very famous recipe from Modernist Cuisine. The idea here is to remove everything that masks the pure pistachio flavor like dairy and eggs. The recipe ends up including little more than pureed pistachio, pistachio oil and sugar. The end result: a gelato with a smooth texture and a pure pistachio flavor. In Modernist Cuisine at Home, the team focuses on recipes that are more accessible to the home cook that require less investment in an array of sometimes tough to find hydrocolloids and expensive equipment. Recipes do not rely on centrifuges, rotary evaporators, freeze driers or autoclaves. The book also describes many ways to cook sous vide without the need for a vacuum packing machine or an immersion circulator. MC@H includes many new recipes and techniques and it also expands on and simplifies stuff from Modernist Cuisine like the pressure-caramelized soups and the vegan gelatos. So in addition to the pistachio gelato, MC@H has variations for Macadamia-Strawberry and PB&J. The basic idea is to use a nut butter (as smooth as possible) along with oil (typically made from the same nut, like pistachio oil), water or juice, sugar, tapioca starch and Xanthan gum to prevent too many ice crystals from forming. As luck would have it I had several pounds of red grapes that needed using up and the PB&J recipe requires grape juice. 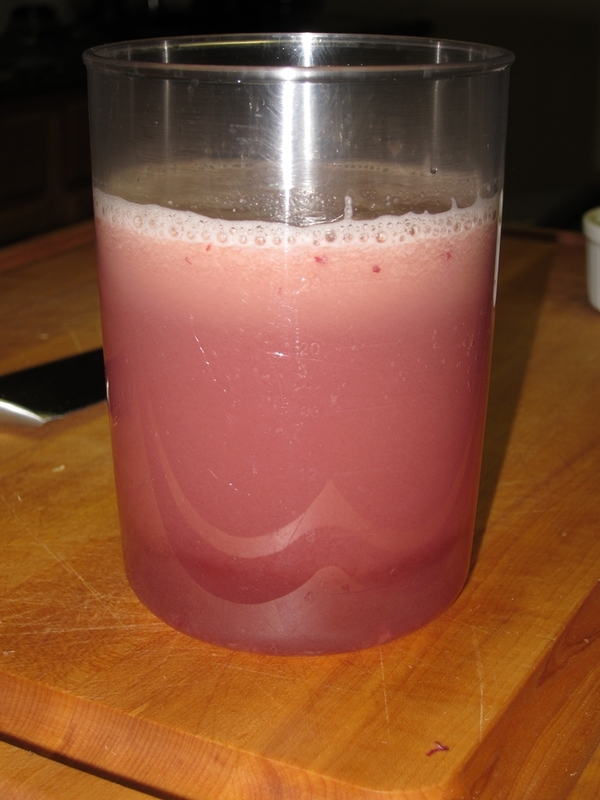 So, first step was to juice all the grapes with my Breville juicer. It’s not the most efficient way to juice grapes since they are soft and a Champion juicer would’ve done a better job. Still, I got more than the required amount of juice for the recipe. I have been making peanut butter for years now. It’s as easy as dumping a bunch of roasted peanuts and a pinch of salt in a food processor and let it rip for a few minutes. That’s all there is to it. I let it run a few more minutes extra this time around to get a smoother nut butter. The last step is to combine everything and, using an immersion blender, keep blending everything over a medium heat till the mixture thickens. Then, chill and churn. The gelato has a brilliant taste and a perfect texture right out of the freezer. 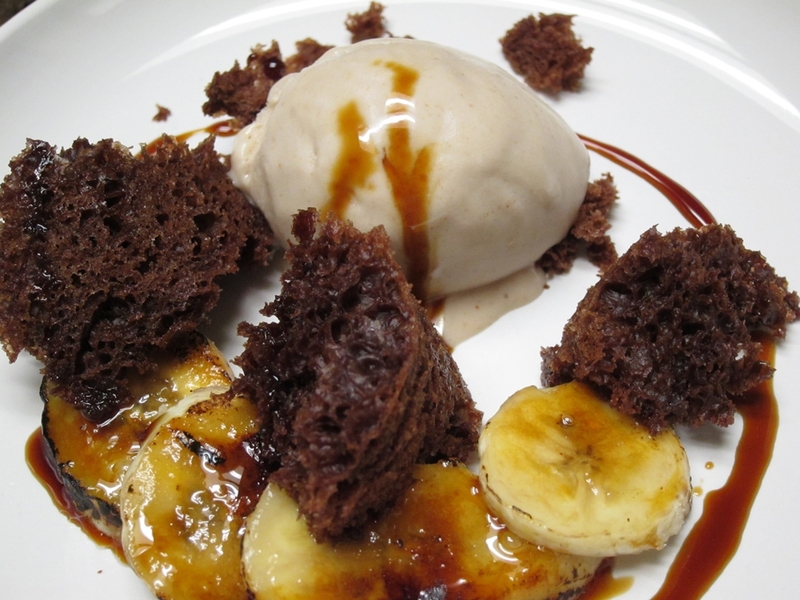 I wanted a quick plated dessert to plate the gelato so I served it with an instant chocolate cake not unlike this one here. To go with it I sliced bananas, sprinkled them with Turbinado sugar and caramelized them with a torch. The plate got a drizzle of grape molasses. The combination is a classic one here and it works great naturally.